For large and small accounting firms. Reach a new level in productivity and efficiency. Share files quickly and easily. Provide clients with custom dashboards for helpful views into the engagement process. Enjoy a full document management system, with built-in archiving, retention and backup capabilities. Do all your time and billing from any web enabled device. Connect directly with your external calendar. Collaborate in ways not possible before, with one centralized location for all your staff, clients and other stakeholders. 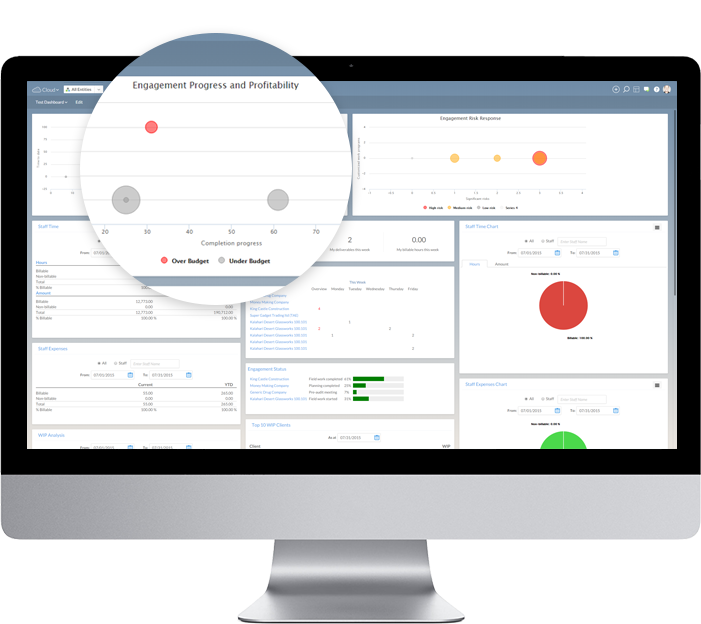 Track and monitor every aspect of your engagement for optimized efficiency and profitability. Leverage built-in roles for easy rights management or create your own. With CaseWare Cloud, you’ll gain unprecedented visibility into your engagements. With innovative web-based tools, you can easily monitor your engagement quality and find ways to increase efficiency and productivity. With CaseWare Cloud, all your engagement needs are in one centralized location, with no need for servers. Plus, with CaseWare Online, team members can work simultaneously on the same Working Papers file, knowing data is always up-to-date. Offering a full time and billing system out of the box, CaseWare Cloud lets you track time, bill clients and perform analysis from any web-enabled device. Centralized engagements, improved collaboration and a full client portal. Take more control of your firm and engagements. Q is for quicker, higher-quality audits. If the country shown above is not correct, please contact us for more information on pricing in your region. ** Includes daily backups for 80 days, with no additional storage costs. Additional charge for recovery will apply. Depending on the amount of data required, there will be a minimum charge of $75 per recovery request. *** Requires Working Papers SmartSync 2013 or higher. Additional licensing fees may apply. At CaseWare, we take the security of your data very seriously. The following information addresses the measures we take to ensure that it remains secure. Where Will My Engagement Data Be Stored? Your data will be stored in state-of-the-art data centers operated by Amazon Web Services. What Type of Controls Are in Place to Protect This Very Sensitive and Confidential Data? Amazon provides physical security and logical security controls at the infrastructure layer. The platform is covered by a SSAE 16 report (done by Ernst and Young) and is PCI Level 1 certified, ISO 27001 certified, and compliant with all major security control frameworks. For details as to their security, click here. For more information about their compliance, including assurance programs and third-party attestations, reports and certifications, click here. Full backups of every client system are run daily and maintained for 80 days. What Kind of Encryption Is Used? Data that is transferred to and from CaseWare Cloud is 100% encrypted at the same strength used in online banking. To access online help for CaseWare Cloud, click here. If you have any questions, please contact solutions@caseware.com.